Whispers in the Loggia: On "Election Day," An "Oasis in the Desert"
I find it amazing that when the Rite of Christian Initiation of Adults was instituted following the Second Vatican Council, that the Church found that as Church we just might need an oasis as we begin our Lenten experience. 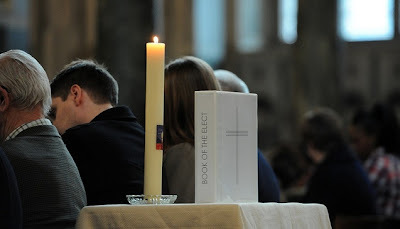 With all the renewed negative publicity about the Church and doubts about its leadership, some of which right now is merited it seems to me, and when one might tend to become dispirited, the Spirit gives us The Rite of Election. Today at the Cathedral of St. Jude the Apostle, it was my privilege to welcome 1,110 catechumens and candidates who will be received into the Church at the Easter Vigil this year. This is the highest number for this occasion in my fifteen years as bishop and quite frankly, I needed this oasis today more perhaps that those smiling and happy persons who shook my hand in the two separate ceremonies. I have several times mentioned before at this ceremony that it is second only to the ordination of priests in the happiness it brings to a bishop and his priests and deacons. I know that there are many others preparing for the Easter sacraments who were unable to be at either of the two services held today and their number will make the number entering the Church even more impressive. Sixty-nine of our seventy-seven parishes and missions were present and the Cathedral was full with about 1,200 people at the 2:00pm and 4:30pm celebrations. Some approach me with tears in their eyes and others seem so grateful for the opportunity to be welcomed by the person who will be their bishop this Spring. A good number of children were present at both ceremonies and I counted about twenty families who would be coming into the Church together – Mom and Dad and the kids. Some also came forward who I would expect will get married this Spring and Summer and wish to become Catholic prior to that special moment. As I said earlier there are many stories in the “Naked City” as the old television show used to suggest. So, if someone was having a desert experience today and could have been with me to share the joy of this annual moment, you would have been most grateful to God for the grace which is operative and obvious in this local Church. Of course, the good feeling of the day was evident far and wide -- among others, coverage is on the wire from rites in Maine, Michigan and the first of its two editions in Savannah. Above all, though, this year's Rites were especially significant -- not to mention significantly well-covered -- across the Pond as the first major wave of Anglicans taking B16 up on Anglicanorum coetibus were received at the ceremonies in their respective dioceses. 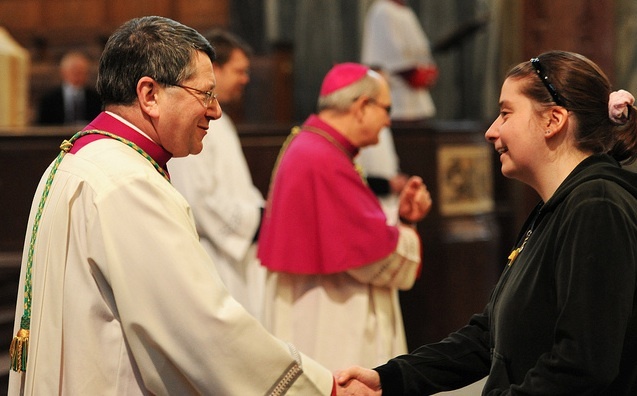 Of course, the record class' reception likewise comes six months since B16's wildly successful State Visit to the UK, in whose immediate aftermath the diocesan phone-lines for those inquiring about the faith were said to have been inundated with calls.